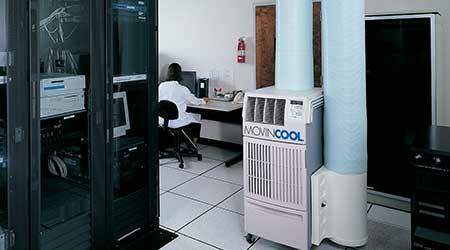 Managers who understand facility needs can better specify the proper portable cooling unit. New-generation portable cooling units offer lower noise levels, given the range of applications of the equipment throughout facilities. The process of selecting portable cooling units does not start with checking out the features and functions of the latest products. Managers first must assess several important issues related to the space and the facility in question. The first is the available power supply. “What kind of power do they have available?” Bombino asks. “For instance, you have the typical outlet that runs on 110 volts (V). Some (portable cooling) units can run on that. The most common units are 1-ton or 1.5 ton units, which is 12,000-18,000 Btus. Those are nice because they’re plug and play. But they’re only putting out 1 or 1.5 tons of cooling. But if you need more cooling, you’re going to need to go with a larger units, and that requires an electrician to install the unit. Managers also need to understand the specific cooling needs of the space. “Before they call, they should have a good idea of how many tons have failed or how many tons they’re going to need, and the square footage of the area and a description of the area,” Brainard says. “In computer server rooms, they hold a lot of equipment that generates heat. That all will help us to determine the total tonnage load because if it’s a 30- by 30-foot room, it might take a 5 tons to cool it. “Maybe you want to provide cooling for some event,” Bombino says. “Humans are always generating some sort of heat. Let’s say the space is 5,000 square feet and you want a temperature of 70-72 degrees, you can calculate that in that space you need 12-15 tons of cooling, depending on the outside temperature. “But if you’re going to have 100 people in that space, you just added 100 mini-heaters, and if that event is a dance, that heat load is going to increase even more. You have to factor in how many people are going to be there, how much heat are they going to give off. So instead of 15 tons of cooling, maybe you’re going to need 20 tons of cooling. The process of cooling a space involves removing hot air, and that air needs to go someplace else. In preparing to research equipment options, managers need to assess the options in the space to be cooled for removing that hot air. Finally, managers need to understand options for handling condensate.